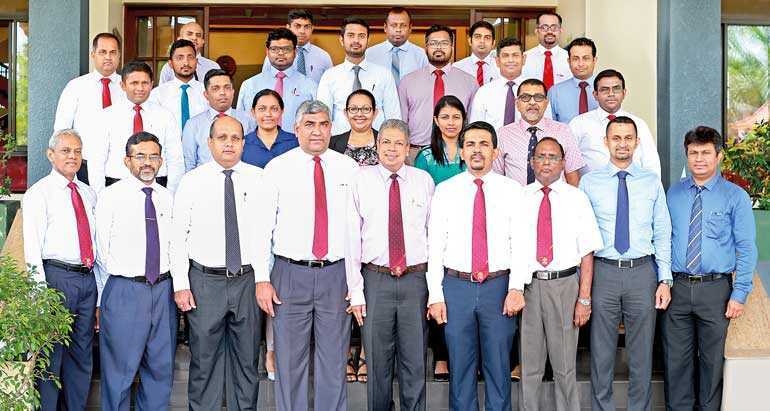 Ensuring that the INSEE team is well equipped to face the dynamic and challenging business environment is an ongoing endeavour for Sri Lanka’s leading manufacturer of cement. INSEE Cement, Sri Lanka recently started an Advance Course in Strategic Management for a batch of senior and middle managers from different functional areas identifying the need for increased competency on business acumen among the future leaders. The course powered by the INSEE Academy partnering with Postgraduate Institute of Management (PIM) was part of the Company’s long term ambitious plan to achieve excellence through improved competence and collaboration. The objective of the course was to enable 18 next level leaders in the Company to get a structured approach to run a business with a holistic view. The four-month course was designed to help participants to gain a competitive advantage by enhancing the ability to think strategically. The strenuous course structure includes regular lectures and class discussions on strategy concepts, multiple case studies on strategic applications and Global Business Simulation (Glo-bus) Strategy game, a world-renowned business simulation. Participants were selected from functional areas ranging from Manufacturing, Commercial, Finance, HR, Safety, Ecocycle, Logistics and Procurement. INSEE Cement, Sri Lanka also known as Siam City Cement (Lanka) is a member of the Siam City Cement Public Company Ltd., a leading cement manufacturer in Southeast Asia, founded in 1969 in Thailand. INSEE Cement Sri Lanka is the only fully integrated cement manufacturer in the country. The company manufactures INSEE branded cement – Sanstha, Mahaweli Marine, Mahaweli Marine Plus, INSEE Rapid Flow, INSEE Rapid Flow Plus and INSEE Extra cement. Further, INSEE Cement Sri Lanka will manufacture INSEE Concrete (Ready Mixed) soon, and currently imports and sells Conwood, popular product in Thailand and Indonesia as a concrete-based replacement for wood. INSEE Cement’s flagship brand Sanstha Cement, was the first Blended cement launched in Sri Lanka and the first “Green cement product” to receive the green labelling certification from the Green Building Council, Sri Lanka. INSEE Cement Sri Lanka owns subsidiaries, Mahaweli Marine Cement Ltd. and INSEE Ecocycle Lanka Ltd. The parent company, Siam City Cement Public Company Ltd. serves the construction needs of the region. Its cement manufacturing facility in Saraburi, Thailand, is the world’s largest cement production complex. Siam City Cement PCL draws from the accumulated expertise and knowledge of over decades of operation and is strongly focused on investing in rapidly advancing regional markets such as Sri Lanka, which show great promise in sustainable construction. The Siam City Cement Public Company has its regional market footprint in Cambodia, Bangladesh, Vietnam, Indonesia and Thailand, in addition to Sri Lanka.